Record-breaking statistics for e-commerce sales were reported in 2015 and the numbers went even higher in 2016. So based on the annual rise in sales, 2017 is expected to bring significant growth to online retail as well. The usage of mobile devices for e-Commerce has been increasing steadily over the past few years and in 2017 its growth is predicted to continue as well. Almost $2.5-millions were spent by US shoppers alone during the 2016 Black Friday and Cyber Monday through mobile e-Commerce. 2017’s sale rates for the same period is forecasted to boost again! Apart from mobile e-Commerce sales, the rise mobile wallets usage is going to be one of the leading e-Commerce trends in 2017. It sounds especially reasonable because of substantial improvements of a mobile checkout process for both Android and Apple, as well as for CVS and Samsung. With growing number of people spending more and more time on mobile devices, there are no preconditions for the slightest decline in mobile e-Commerce. Slowly but surely, mobile e-Commerce will take over e-Commerce. So make sure you store is responsive to provide seamless mobile shopping experience. Live chats for customer support has seen a rise in 2016. According to e-Commerce predictions for 2017 a greater number of online retailers are expected to offer this service this year. As more and more businesses experience the positive effect of providing a real-time customer support through the chat boxes, there’s no reason to give a second thought to the implementation of such a useful service. However, for those who cannot maintain live chats, chatbots can be a great option. They serve as an efficient alternative to live chats and can provide the required assistance for customers. No wonder, the appliance of chatbots is also predicted to rise this year. Statistics collected by Cart2Cart, a leading service of automated shopping cart migration, shows that a share of stores using hosted solution was steadily growing throughout 2016 and is previewed to continue its active growth in 2017. More and more store owners are attracted by benefits of hosted shopping carts like Shopify, BigCommerce, 3DCart and willing to shift from their on-premise platforms. Cart2Cart automated service offers a hassle-free migration to the popular hosted e-Commerce solutions. It lets you move securely and smoothly all the valuable data like products, categories, customers, orders, images, manufacturers, etc in shortest possible terms and without any programming skills required. There are already lots of stores on social networking sites and in 2017, social commerce is expected to become even more extensive. In the past, social network sites served largely as a marketing tool for online businesses, since transactions had to be performed exclusively on the company's’ website. With the uprise of apps providing necessary shopping functionality, social networking sites have turned into a full-fledged e-Commerce channel where users can conduct actual transactions. Introduction of another medium for online retail has drastically expanded the reach and the opportunities for e-Commerce businesses. Thus, they are encouraged to exert more efforts for strengthening their presence in social media, especially such powerful channel as Instagram. Consult this handy infographic accurately depicting current trends for social commerce, in spite of requiring some figures updating, and you will see an urge to start to play more actively within your social profiles. It’s crucial to develop and implement a successful e-Commerce social media strategy to gain a competitive advantage. Cart abandonment will always be one of the biggest challenges for e-Commerce businesses. The growth of mobile e-Commerce has aggravated the situation as the attention span of online shoppers are constantly getting shorter. Thus, retailers are forced to be more creative with their retargeting efforts. Retargeting refers to all acts by online businesses to reach out to users who abandon their carts in the hope to convince them to complete their transactions. The most popular retargeting strategy is sending cart abandonment emails. Such emails are more effective when they are personalized, as evidenced by the increase in success rates for emails that take into account all the available details about a cart abandoner. As a result, in 2017, personalization of all retargeting efforts will be one of the key trends in e-Commerce industry. Virtual reality is gaining popularity among e-Commerce retailers. Sports gear shops, for example, are using virtual reality to let the customers “try” their gear within different environments. Since VR is still at its onset and provides a kind of exceptional experience, it is perceived as a valuable marketing tool. It will cause a wider implementation of VR for online businesses in 2017. 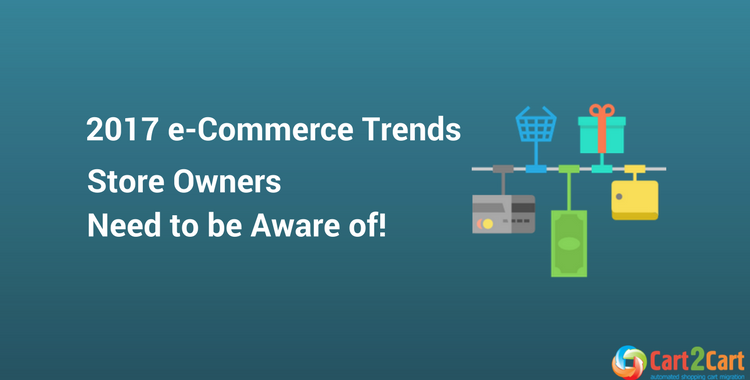 Remember that to survive in the heavily competitive world of e-Commerce, one must alway stay abreast with the latest e-Commerce trends. So go mobile, use live chat or chatbots, be on social media, personalize your retargeting efforts and utilize virtual reality to face 2017 with no fear! Kenneth Sytian is a web designer from the Philippines. He has been designing websites and developing web apps for more than a decade. His no-nonsense approach to design coupled with his vast creativity is a winning combination for his clients.